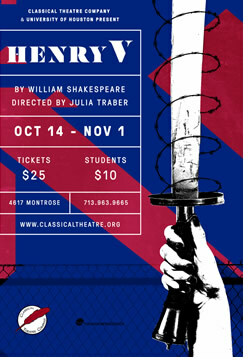 Henry V presented by Classical Theatre Co. - Printer Friendly Page - Opening Soon! - Theatre Port Houston - Theatre Auditions News and more! Date 2015/10/2 7:00:00 | Topic: Opening Soon! As one of Shakespeare’s finest “history plays”, Henry V centers on the events leading up to, and following, the famous Battle of Agincourt in the 100 Years War. This English victory saw King Henry’s forces take on, and defeat, a vastly superior French army. This remarkable feat lives on in the annals of military history, and will be celebrating its 600th anniversary during the run of CTC’s production on October 25, 2015.